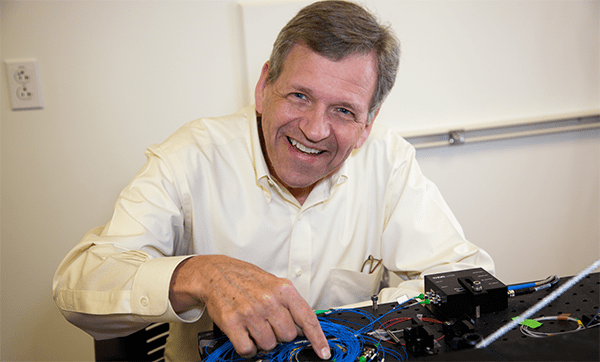 O’Donnell is specifically cited “for leadership in biomedical ultrasonics and medical imaging technologies.” The technologies O’Donnell has conceived and developed have transformed real-time ultrasonic imaging into a leading diagnostic tool. Envisioning a new approach to medical imaging, O’Donnell used the power of digital processing to address fundamental issues that limited image quality by employing real-time, adaptive array processing to overcome phase aberrations. Current high-end scanners feature many of the concepts developed by O’Donnell during the 1980s. He has also led the integration of real-time imaging systems into therapeutic devices, such as a synthetic imaging approach where the entire ultrasound array and front-end electronics are integrated into the tip of a coronary catheter. Other important contributions to medical imaging include his MRI phase contrast pulse sequence integral to today’s MRI angiography procedures. From 2006 to 2013, O’Donnell held the first Frank and Julie Jungers Endowed Deanship of Engineering at UW. Before arriving at UW, O’Donnell served for 10 years as chair of biomedical engineering at the University of Michigan Ann Arbor. The IEEE Biomedical Engineering Award was established in November 2010 as one IEEE’s Technical Field Awards. It is awarded to an individual, a team, or multiple recipients up to three in number, who demonstrate outstanding contributions to the field of biomedical engineering. Awardees are evaluated on the basis of their impact on the profession; succession of significant technical or other contributions; leadership in accomplishing worthwhile goal(s); previous honors; other achievements as evidenced by publications, patents or other accomplishments; and the quality of the nomination. Awardees receive a bronze medal, certificate and cash honorarium.